The Super Hidden Sky Terrace! Did you know there's a city policy under the 1985 Downtown Plan that requires new commercial buildings to have publicly accessible open space? In some places, it's pretty obvious that you are on private property, but enjoying the park like atmosphere in the hustle and bustle of downtown San Francisco. For the downtown workers, these privately-owned public open spaces (or what the city calls POPOS), it's an opportunity to enjoy their lunch away from their office desk. I learned about this from a Tweet from the city government, and the link in the tweet landed me on the San Francisco's Planning Department's website about these POPOS, including an interactive map. One of these public places I wanted to find was the Sky Terrace at the Westfield Mall, formerly the home of the Emporium. Back in the day, the old roof of the Emporium was the location of holiday carnival rides that was hoisted by crane every year until the company went out of business. While the city map showed where it was located, it did not tell me how to access it. Since I was shopping around the downtown area, I decided to drop by the concierge desk at the Westfield Mall for more information. Asking the young lady at the desk, she didn't know what I was talking about, saying this was the first she heard of this rooftop. I mentioned about the city policy, and she contacted her superiors for more information. While I was waiting for five minutes, I did a search on my phone and it told me that there's no direct access through the mall. Shortly after, the concierge told me the same answer. You'll need to access it through the outside building entrance on Market located on the far left side of where the building property line ends (next door is Walgreens). 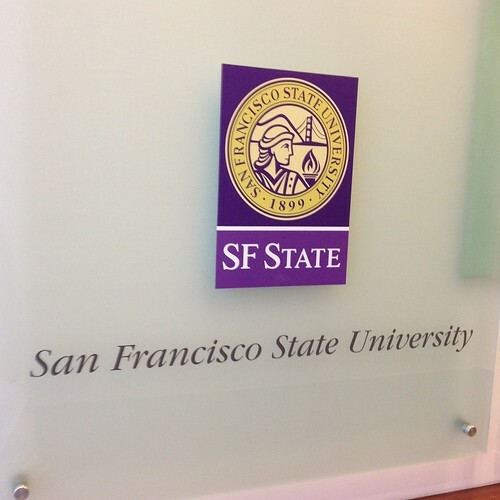 You will see a purple San Francisco State University Banner and the address 835 Market Street. This is also the entrance to San Francisco State's Downtown Center. My Alma Mater (times two) and Employer! Walk through the doors and down the hallway and you will see a security guard desk on the right. You'll know you are in the right building when you notice the SF State signage on the left just when you enter the building. Ask the security guard that you would like to access the sky terrace. Depending on how nice the guard is, they'll tell you how to get there, or give you a surly attitude. Remember, floor nine is the place to go. You'll see an elevator bank to the left of the guard's desk. 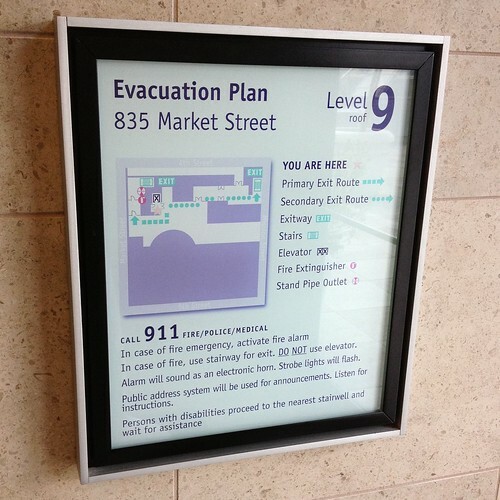 Take the forward left elevator and select floor nine (there will be the words "Sky Terrace" next to the button). This is the only elevator that provides service to the roof, so don't take the wrong elevator. At the ninth floor, just make a quick left and you are at the Sky Terrace! Going to the rooftop, it's so hidden and challenging to access that it's so quiet up there. While the streets are busy with people running around with shopping bags of holiday stuff, you are just alone on the rooftop. There are tables, chairs, and benches to relax upon, but there are no restroom facilities or any easy to access place to grab a bite. The view is good, and the most obvious thing you'll see is the famous dome that was originally there when the Emporium existed. 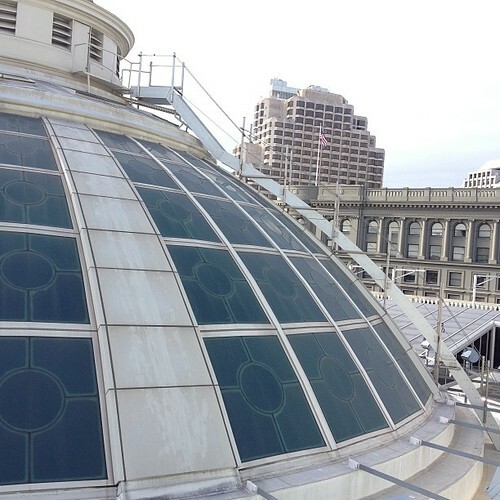 You'll also get a view of the western skyline, including City Hall. If you need food or access the restrooms, go into the mall to the bottom level to access the Emporium food court. If you have a SF State student/staff/faculty ID card, show it at any of the food court vendors and receive the mall employee discount ranging from 10% to 15% off, and certain vendors selling coffee and beverages for just $1. To review the vendor list with discounts, click here. It's a challenge to find because it's not obvious to find. But if you want some place away from the busy streets of San Francisco, this is the place to find some peace. Their heating and air conditioning units are also on the roof and will make it a little loud, but if you don't mind the noise, just listen to music or wear earplugs, you'll do perfectly fine. Word has it it's only open Monday-Friday when the offices in the building are open, but there's nothing telling me that. I entered on Saturday, December 22nd and while the guard said access to the area may not happen, but the elevator went to the 9th floor without any trouble. Technically, SF State is open on December 22nd for final exams (yes, there's finals on Saturday), so I guess I got lucky. There is a change in city laws regarding signage. In January 2013, the city will be enforcing a signage policy where there must be signage guiding people to these publicly accessible locations. 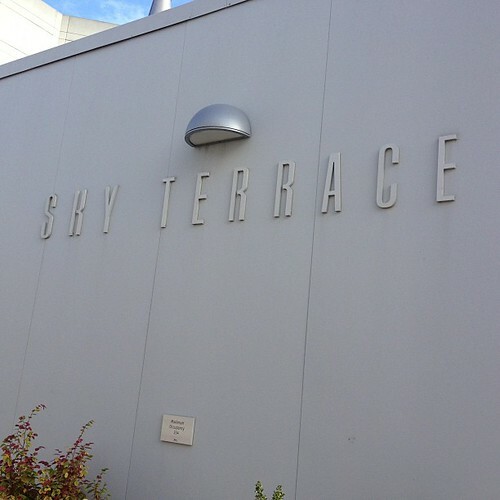 I'm hoping others will find the Sky Terrace with the new signage, but I'm also betting this hidden spot will still be hidden because people don't really know it exists; even the maps in the mall doesn't say anything about the Sky Terrace. So now that I told you about this spot, wait until a nice warm day and go enjoy your time on the Sky Terrace!